Under the onslaught of another Christmas season, Santa Claus/Scott Calvin is feeling even more pressure because Mrs. Claus is expecting a little Claus and also longing for the company of some “tall people.” So Scott agrees to let her parents visit as long as they believe that they’re really in Canada rather than at the North Pole. Enter the bad boy of the Council of Legendary Figures, Jack Frost, who’s supremely jealous of the figures who have their own holidays, especially Santa. 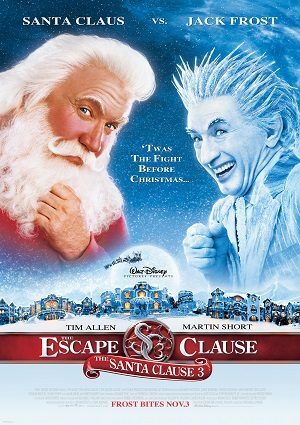 So he launches a plan to sabotage the toy factory and compel Scott to invoke the little-known Escape Clause and wish he’d never become Santa – causing Scott to rewind 12 years where it all began.